"MBIS BISS Can/Am. GCH. KYLADOR'S BUSTIN THRU TH'REEDS CGC ADC AGI WCI JH CD JAM ROMX"
Reid is Roaneden's Foundation Sire, bred by Lillian Greensides of Kylador' Perm Reg'd www.kyladorkennels.com Reid is from "Ch. Kylador's Jack of All Trades, and " NSDTRC BISS, MBISS (CKC) OTCH. Ch. Kylador's Karma Kamelia WCX . His is a 3rd Generation Best in Specialty Show winner ! Reid is a wonderful all purpose dog, meeting all our expections. He has excelled in the Showring, a Multiple Best in Show, Best in Specialty Show winner and Multiple Group winner in Canada, and a Group Placer in the US. Reid earned his American CH with 4 BOB wins and taking Best of Winners at the NSDTRC USA's first AKC Supported entry October 2003, over a huge class of quality dogs. *Reid was #1 Toller in Canada for 2006. He finished off 2006 Ranking #12 Sporting Dog in Canada, a breed record!!! 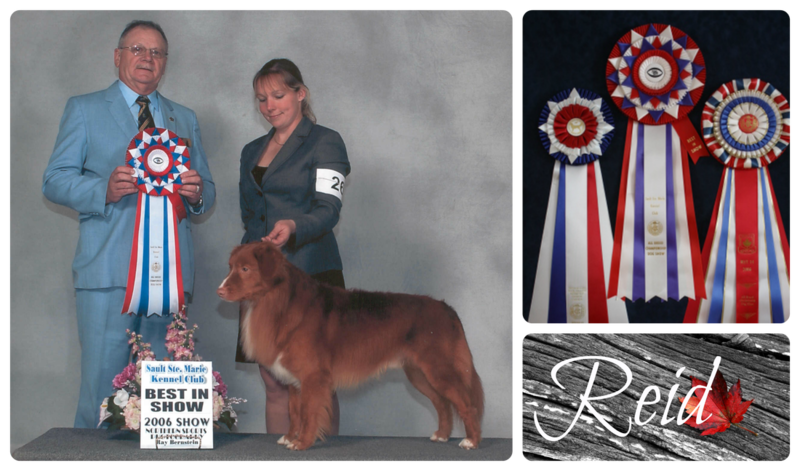 Reid won a Group 2nd at the North American Championship for Dual Titled Dogs held at Cobo Hall, Detroit MI. This is a black tie event promoting the dual purpose dog. All dogs competing had to have a Conformation Championship and a working title. field work has been done without the use of force fetching. He has been easy to train and works to please. 19 1/4 " at the withers and is an athletic 40 lbs.